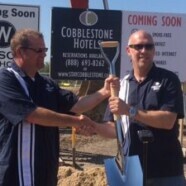 New Cobblestone Hotel breaks ground in downtown Hartford | Vandewalle & Associates, Inc.
FROM THE WASHINGTON CO. INSIDER, HARTFORD, WI – Groundbreaking in Hartford on September 13 as Cobblestone Hotel celebrated its newest addition. The 60-room hotel on Highway 60/ 110 E. Sumner Street will be built along with Wissota Chop House restaurant on the ground floor. The redevelopment site is in the heart of downtown Hartford. Positioned across from the Jack Russell Memorial Library and walkable to a range of other downtown amenities, the location makes it an easy choice for tourists and other visitors. Hartford Chamber executive director Scott Hanke said the development is a “shot in the arm” for the community. “This especially helps with tourism as we now have places to stay and play as well as another dining option and 60 more rooms,” he said. 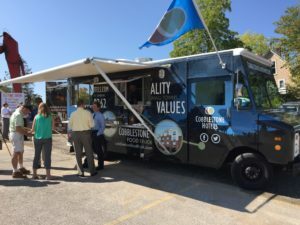 A number of local business leaders attended the groundbreaking, along with Hartford mayor Tim Michalak, city administrator Steve Volkert, representatives of Cobblestone Builders, and Vandewalle & Associates. The city of Hartford will give Cobblestone Builders an incentive of $650,000 when hotel occupancy is approved. Cobblestone basically purchased the property for $1. The hotel is expected to generate at least $110,000 in property taxes a year for the next 10 years.